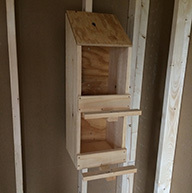 Shown is an 8x14 pigeon house with an epoxy floor and 1/2" x 1/2" vinyl coated wire throughout. There are two separate rooms divided by a wire wall. It has a screen door at the opening and two 18" x 27" windows. 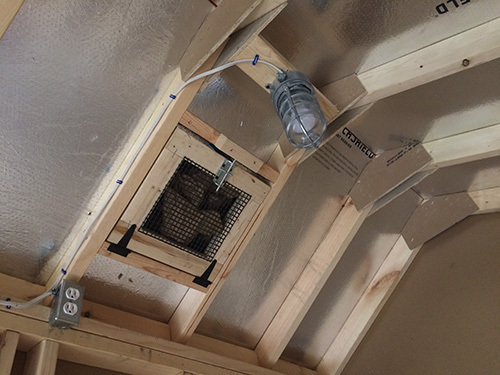 There is wire over the opening for the solar exhaust fan. The house includes our electric package. Four wired vents are 6" above the floor. The front of the pigoen house includes a run at the window height. Call (717) 205-2660 with questions or to order your Amish made custom pigeon house. Pigeon Houses Can Be Delivered Anywhere in the Continental US. They Will Arrive Fully Built. Pigeon houses can be customized to your specifications. This secure Quaker Style pigeon house features two rooms and plenty of ventillation.